I'm new to Thunderbird. I downloaded emails from a custom server and it worked fine: as TB downloaded them they were deleted on the server. Now I downloaded some Gmail emails, and that didn't happen. They were downloaded to Thunderbird but remained on the server. I'm using pop.gmail.com with SSL. I see no option that may be making TB not delete them. This is actually not controlled by Thunderbird in this case, but by Gmail. 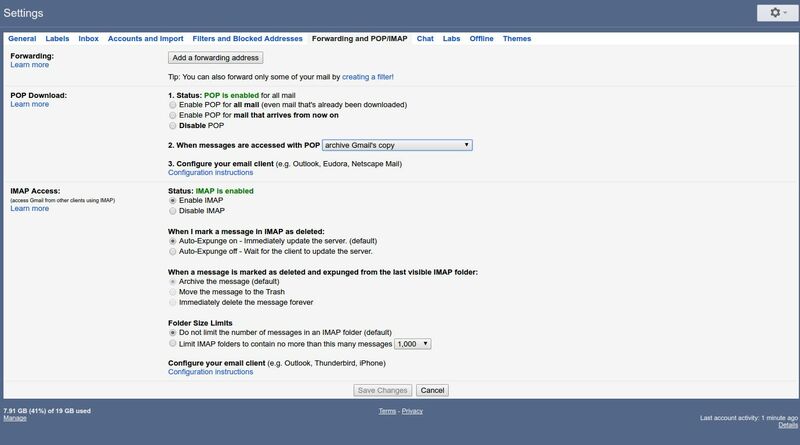 By default, when Gmail is accessed with POP it will not delete messages, it will archive them... Open Gmail in a browser and go to Settings, then select the tab labeled "Forwarding and POP/IMAP", under the POP Download section, item #2 "When messages are accessed with POP" change the drop down from archive Gmail's copy to delete Gmail's copy and that should take care of it. Not the answer you're looking for? Browse other questions tagged email thunderbird gmail or ask your own question. How do POP3 clients delete emails later? How do I make Thunderbird work in parallel with my GMail account? How to forever delete emails from Thunderbird?